peltz at hand: A "Mantidote" for the Wintertime Blues? A "Mantidote" for the Wintertime Blues? Despite the dark pleasures of autumn, which I alluded to in my last post, we know that it all comes to an end about this time November. Strong winds will have stripped that very last vestige of life—the leaves—from the surrounding landscape, and one is left coping with winter’s stark dormancy. This is certainly a cause for depression among creature-lovers. But mope not, because if you act now, you can preserve one of summer’s treasures to last you well into the winter season. And it’s as simple as this: Go outside right now and catch yourself a praying mantis. Number 2: They’re just going to die anyway. That’s because they hatch out in the spring, spend all summer preying (and “praying”), mate & lay their eggs in the fall, and then promptly die from old age or frost, "whichever comes first”. And finally, Number 3: They are simply amazing to behold. I know, because I kept one last year—his name was Jerry. Fascinatingly, mantises are one of the few insects that can rotate their heads. They also appear to have excellent vision (their eyes are a curiosity unto themselves), and a mantis’ motions and behaviors seem almost as intelligent as those of a small vertebrate. 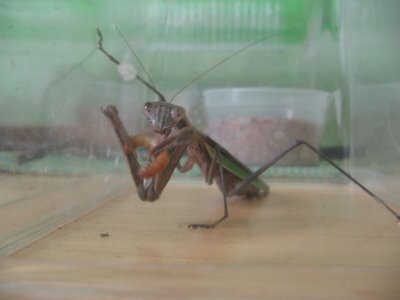 Of the four or five people who read this blog, I know I’ve got at least one predator-lover out there (you know who you are), so I’ll now say something a bit gory regarding how a praying mantis captures and consumes its prey. (The faint of heart should read no further.) 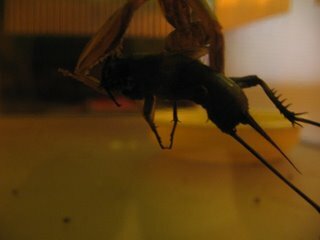 Jerry would hang upside down and ‘swoop’ his spiny forelegs down to capture an unsuspecting cricket. Grasping it tightly to the point that it could not move, he would then chew a small, rectangular incision into the top of the cricket’s thorax (just below the vestigial wings), and proceed to munch the life right out of it. It’s awesomely gruesome, and guaranteed to send shivers right down your spine! (In fact I just got shivers merely thinking about it again.) Happily, no mantis poses any serious threat to human beings, though the mandibles can deliver a painful pinch, so just remember not to be foolish (like I was) and pick them up. By the way, once your praying mantis finally kicks the bucket, you can easily preserve him for years (and quite nicely) with ethyl alcohol or formaldehyde. Barring that, rubbing alcohol will keep him looking like a sharp souvenir for several months. The true story of Jerry and the cricket. PS: To prove to yourself what awesome predators praying mantises are, be sure to check out this website, Praying Mantis Makes Meal of a Hummingbird (it's for real!). Update: From Wikipedia, more excellent photos of mantids here, including a link to a YouTube! 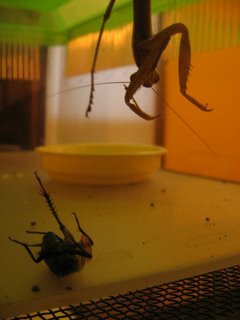 video of a mantis capturing a cricket. Doug sure is one weird fello!